Tons of new, existing and improved varieties were on display during the California Spring Trials, held from March 23-27. Can you still remember what the varieties were presented at Windmill Nursery in Buellton, Floricultura in Salinas and Headstart Nursery in Gilroy? Below, we will refresh your memory, by presenting the three highlights of Beekenkamp and Monrovia at Floricultura and Kientzler, J. Berry Nursery, Skagit and 2Plant International at Windmill and the varieties of Danziger and Varinova at Headstart Nursery. For many years, Windmill Nursery has been a CAST location and this year too. Below the breeders and propagators that were displaying their varieties at this location. Welcome to the Windmill site. Marc Englert of Pelemix organizes the trials at the Windmill site for several years now. This year, at this location, Kientzler, 2Plant International, J.Berry Nurseries, Skagit, Oasis, Pelemix and Dramm were showcasing their products. Jim Berry of J. Berry with Mitch McDonald of Botany Lane Greenhouses, one of their largest young plant producers for Hollywood Hibiscus. They are presenting Hollywood hibiscus Runaway Beauty. This new variety has large bi-colored pink and almost semi double flowers. Funny to share is that you can do a quick quiz on hollywoodhibiscus.com. It will show you what character suits your personality and your landscape best. Crown Jewels Begonias are bred for humidity resistance and heat tolerance. Last year, they introduced the first 4 varieties and they now expanded the series. "This collection is perfect for partially shaded landscapes, hanging baskets, container gardens and can be used indoors as houseplants." Summer Spice Hardy Hibiscus Cordon Bleu is part of the Summer Spice hibiscus series and is according to Jim Berry a real breakthrough. "Besides the stunning blue color, it also flowers from spring to frost with a naturally compact habit”. Look for more new introductions in this series. Andreas Kientzler of Kientzler presenting Fairy Kisses Vanilla Berry. It is a new series released in North America. It is scented, doesn’t set seeds and flowers all summer long. Pocket is a new compact calibrachoa is a new compact growing series. Due to the dense branching and plant habit, it suits small pot production very well. "It remains compact for the grower, but becomes more vigorous at the consumer." Compact Double Rose Pink is a new double flowering petunia in the Compact Double series. The series is characterized by its tight habit, smaller flowers and better performance for the consumer. On top of that, it is easier to clean." Marc Radsma of Skagit Horticulture holding the Hellebore HGC® Ice N’ Roses® Red from German breeder Heuger. It is a vigorous Hellebore with ruby-red flowers. Corydalis Porcelain Blue is part of the Hillier Collection by Hillier Nurseries from the UK and was introduced last year. The aqua blue is what makes the flower stand out. The flowers are held in racemes in spring above the foliage and profusely repeat flowering in late summer-fall. However, there is more that makes this variety unique. "The foliage is blue-green fern-like foliage, it has no summer dormancy, is profusely repeat flowering and has no seed set." Senecio Angel Wings has velvety leaves with scalloped edges. It is hardy to USDA Zone 8 and will reach a height of 12 inch and spread of 10 inch. 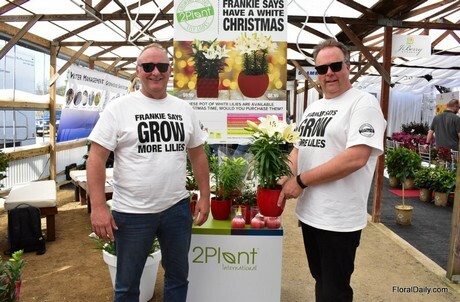 Owners Frank Riteco and Pieter van der Lans of 2Plant International presenting two L.A. Hybrids. Hybrids. “For Christmas, growers are always focusing on poinsettias, but it puts pressure on the prices of these products. We are here to show that there are other crops they can grow, like our white lilies. We asked several customers if they would purchase these items at Christmas time.” See the next picture for the answers. Dahlia Dreamy Fantasy (on the left) and Dahlia Dreamy Flame (on the right). Both Dahlias are bred by Gerrit Preijdeand for the first time they are now shown in North America. For Dreamy Fantasy, the contrast between the flower and the foliage is what makes the variety stand out. 2Plant International used to supply their lilies in one color per pack, but after a survey, they recognized that the majority of the end consumers (60 percent) prefer the six colors per pack over the one (12 percent) or two (36 percent) colors per pack. So now, they also supply their lilies in six colors per pack. This year at Floricultura: Beekenkamp and Monrovia. At Floricultura in Salinas. At this location, Beekenkamp and Monrovia were showcasing their varieties. 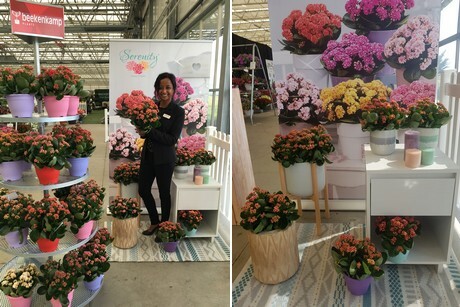 Sirekit Mol of Beekenkamp in front of their new design for Labella Dahlia, with the slogan “From big to small, we have it all!”. She is holding the Medio Fun Golden Eye for the 4-6” pot. One of the varieties that is doing very well worldwide. Beekenkamp went into petunias and introduced their Petunia Tea series at the CAST last year. And they seem to do a good job. At the PennState Trials, they sent in their ten varieties and their variety Rose Morn (the pink-white variety in the picture) was awarded the best variety among all varieties that were sent in (114 in total). "We were very proud with the result as the new kid on the block on the Tea series." A new line of Echinacea. The series is called Evolution and is a result from their own selection work. The series is compact and currently consists of 5 colors which change during the season. A new line of Heugera, called Sirens' Song. The series consists of four varieties and the following three varieties are in the picture; (fltr) Dark n' Bright Coral Bells, Orange Delight Coral Bells and Spicy Lime Foamy Bells. The flower stems on all varieties are shorter. Headstart Nursery partnered with Danziger "Dan" Flower Farm to showcase existing and new varieties. At this location, for several years now, also Varinova is presenting their varieties. Headstart Nursery ornamental plugs, prefinished cyclamen, vegetative liners, and other product lines were also on display. Assaf Golan of Danziger presenting a new variety in the Amore series, namely Amore Pink. This series was introduced in 2017 and at Danziger, they are continuously adding new varieties and improving the existing varieties. Blushing Orchid is one of the latest intro's (2018) to the Sun Harmony Impatiens series. "The series is known for its large flowers, uniform growth and long flowering period. Blushing Orchid is a new color in the series, which currently consists of 13 different varieties, with the same type of behavior. Vanessa Bicolor Pink is a new Verbena in the new Vanessa series. 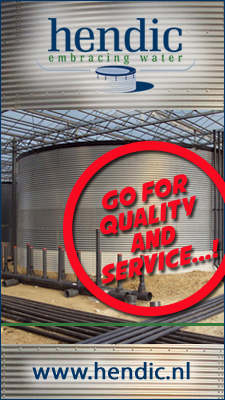 The verbenas in the series are compact, heat tolerant, mildew and rain resistant. On top of that, it has a mounding habit, continues flowering and stays compact. Bart Kuijer of Varinova. He is holding Merita Red. At the CAST, they announced that Syngenta will represent Varinova in the North American market. The Merita Midi Cyclamen is very suitable to grow in a 10.5-12 cm/4” pot. The plants have a compact shape, large midsize flowers and bloom abundantly. Merita Red is one of the in total 12 colours. The Merita series includes some Flamed and Shine colours. Being quite new in the Maxora Fringed series, Maxora Fringed Red is a valued addition to the programme. Maxora Fringed, consisting of 8 colours, is suitable for pot sizes 11-15 cm/4-6”. The decorative plants have large fringed flowers and a compact plant shape. Facila Red shows many leaves and abundant flowering, which applies to the entire series. The Facila Mini Cyclamen series, consisting of in total 16 colours at this moment, is suitable for pot sizes 10.5-12 cm/4”. The series include 4 very attractive Shine colours.